Deciding to add a front porch to your house is like deciding to put on makeup: It raises a host of options. Front porches gained steadily in popularity for the 10 years leading up to 2011, when two-thirds of the houses built boasted front porches, according to U.S. census data. Several factors influence the size of porches, but their pleasures keep their growth in numbers vigorous. 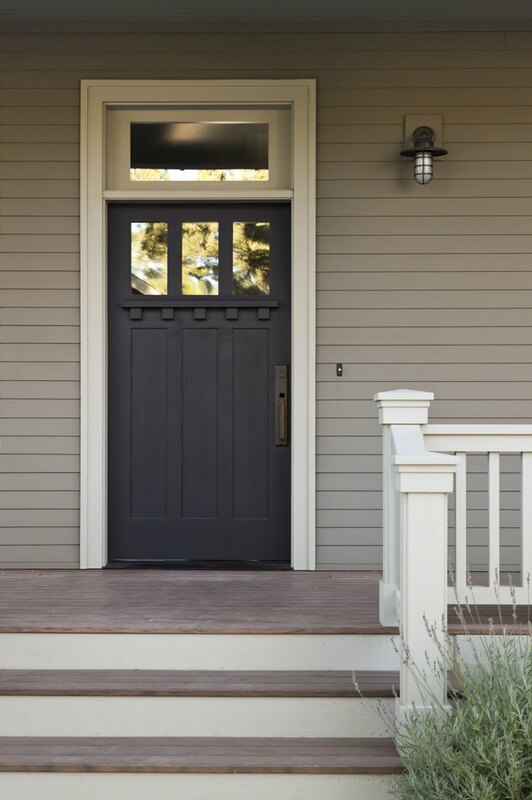 Many factors determine what makes a front porch typical. Builders, real estate agents and community developers agree that average home size has decreased over the last couple of decades, as homeowners escape isolating suburban sprawl for the pleasures of denser urban living. Long work hours increase the appeal of living closer to work and walking to public transportation. Both tighter interior spaces and tighter budgets help revive the historic pleasures of front-porch-sitting. Front porches both make possible and set limits on contact with passersby. Especially to families no longer or not yet centered on raising children, a front porch can facilitate a small but substantial entree into the neighborhood and surrounding community. One of the strongest factors influencing the size of a typical front porch is accommodating porch users, doors and furniture. Very small porches, less than 4 or 5 feet deep, contain specific hazards. While entry doors customarily swing inward into the house, screen, storm and security doors swing out. One guideline for practical porch size is enough room for visitors or family members to share space safely with a door arcing 30 to 36 inches, resulting in a porch with an expected minimum depth of 6 feet. Adding furniture means adding space. A porch with furniture can aim for a minimum depth of 8 to 10 feet. To accommodate a small table and two chairs, count on a length of 85 to 96 inches, according to RemPros.com. For fitting two lounge chairs, figure on 10 feet in length. One rule of thumb is to plan an area twice the length and depth of each piece of porch furniture, to prevent stumbling. Just as front porches let homeowners see and greet neighbors, they are usually designed for some privacy as well. Typical porch size may vary widely between neighborhoods and communities because of varying ideas about the space needed to create a successful balance between public and private enjoyment. Zoning codes often shape what is typical. In an older, heavily built city like Erie, Pennsylvania, the building code limits front porches to 5 feet deep. Exceptions may be made through a process of individual review. Street set-backs, yard dimensions, the ratio of building to land and the possibility of overlooking others' property may determine local building requirements. In communities with more flexible guidelines, like San Jose, California, homeowners are encouraged to build porches that capture the existing architectural history and enhance the appeal of houses in their surroundings. A major influence on porch size is the architectural style of your house and the styles of houses in your neighborhood. Porches promote architectural harmony by fitting into the proportions of surrounding porches. A typical porch for a Victorian house is not typical for a ranch. The porch that will look best on your Victorian is also likely to bear a strong resemblance to the porch on the Victorian next door. Looking at architectural histories and builders' pattern books lets you try out different sizes and shapes of porches on a house similar to yours. Height, depth and distance from the street and adjoining properties all play a part in whether a porch seems welcoming or off-putting, typical or uncomfortably odd in its setting. Actively using the porch may stimulate interest in expanding porch space. Commercial resources offer an ever-widening spectrum of leisure furniture, and designers suggest adding lights and screening, in insect-prone areas, to maximize use of your porch after dark. In this case, typical porch size depends on homeowner enthusiasm for using this space as creatively and effectively as possible. What Is the Recommended Dining Bench Depth?